Founded in 1982, Hitachi has been an innovator in the technology industry from the very start. In fact, it was Hitachi that pioneered ultra short throw projector technology,which is now a mainstay of the industry as a whole and one of the most transformational technologies to infiltrate the corporate sector. Hitachi projectors continue to drive progress, offering world leading image clarity and portability. 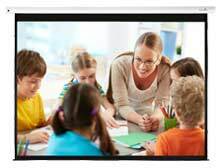 The full range of Hitachi projectors covers a variety of markets including installation, education and corporate projectors. Designed to be clear, bright and adaptable, the brand’s range incorporates a variety of security features and HDBaseT.